PhillyVoice reporter Sinead Cummings tries out the Pec Seated Press machine at X-Force Philadelphia. 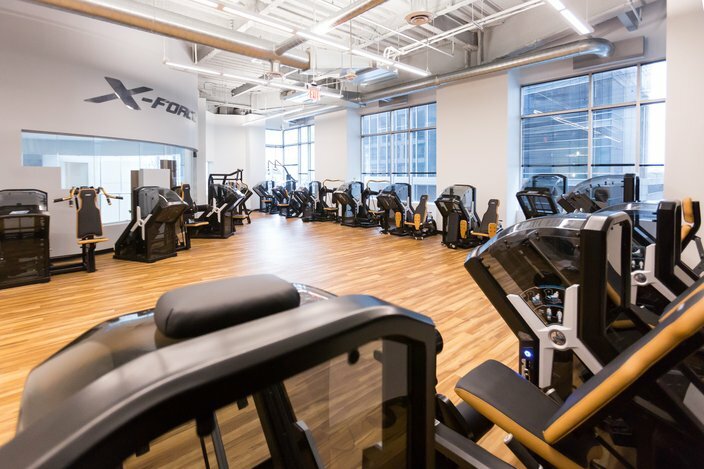 The newly opened X-Force Philadelphia, a first-of-its-kind facility in Center City, promises to deliver a strength-training workout that is "the hardest 30 minutes of your life." Up for a challenge, I decided to test it out for PhillyVoice's "We Tried It" series. Spoiler alert: I only made it through 18 minutes. 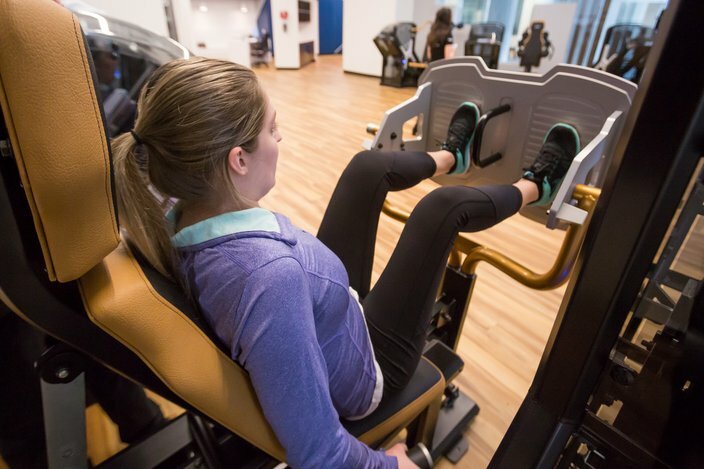 During a typical session at the gym, you work one-on-one with a trainer for half an hour to power through roughly 12 exercises – doing six to 12 reps for each – on the facility's pricy equipment from Sweden. The cost for each machine is between $11,000 and $15,000. The 22 machines each work a different muscle group, but all have a unique tilting weight stack. The purpose is to offer resistance on the lowering phase of the movement. Essentially, it makes your muscles work harder when lowering weights. The 5,000 sq. ft. facility is located in the Graham Building at 30 S. 15th St. in Center City Philadelphia. This "negative accentuated" training works muscles so intensely that it's recommended trainees only use the X-Force machines once a week. 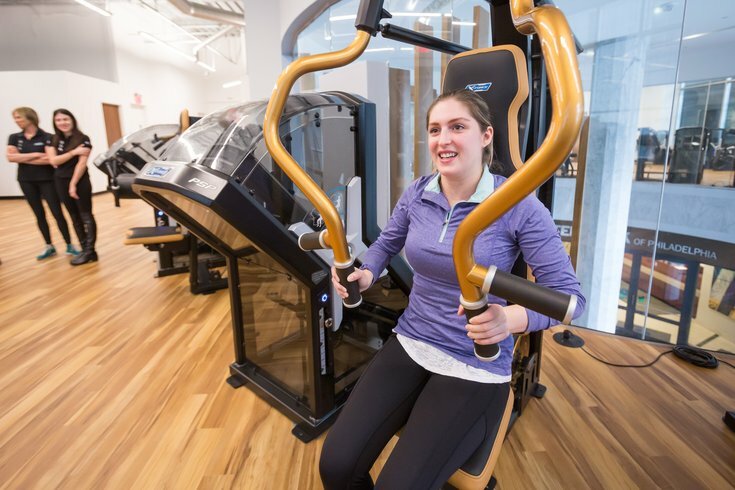 For the lazy gym-goer, it's a dream come true. To work out your whole body, you only need to carve out 30 minutes each week. The trainers concentrate on making each session as efficient as possible, maximizing the short period of time they have you. That means no music, no TVs, no cell phones and no idle chit-chat. You're there to feel the burn, not discuss your weekend plans. Roger Schwab, who left retirement to open and operate X-Force Philadelphia with his wife, Elanna Schwab, was my trainer. 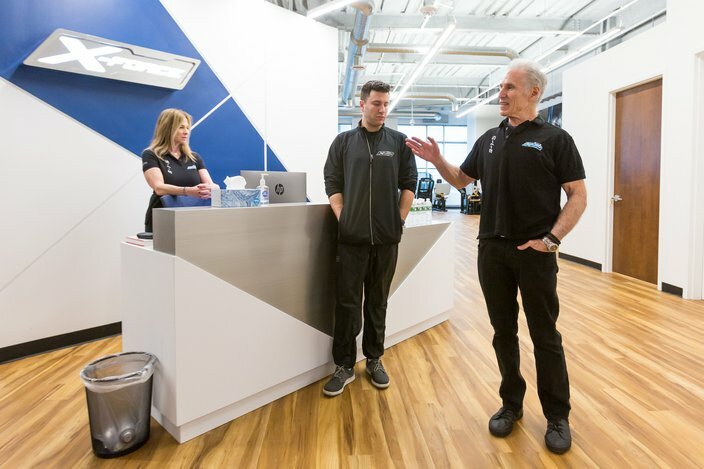 X-Force co-owners and certified trainers, (L to R), Elanna Schwab, Jesse Schwab and Roger Schwab explain the benefits of using the “negative accentuated” training machines in their Center City Philadelphia location. 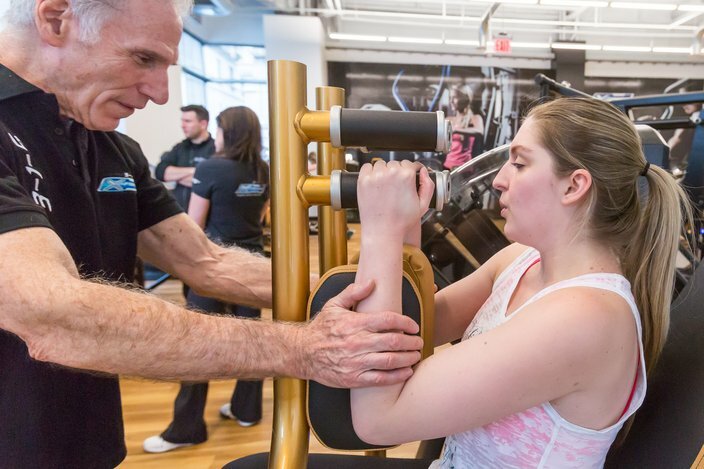 He was college football's first strength and conditioning coach, working with Penn State in the mid-'60s, and was the first to introduce X-Force to the United States in 2012, at the Main Line Health & Fitness in Bryn Mawr, when he was the facility's owner. When asked how he became interested in fitness in general, he replied, "I was a skinny kid who wanted to play football." Schwab had me start with lower body exercises, showing me how to position myself and counting out three seconds of pushing the weight up, one second of holding and five seconds of bringing the weights down. The first time you use one of the machines, the burn your muscles feel bringing the weights down is shocking. Your muscles have to work 40 percent more when lowering than when lifting. So, imagine you lift a 100 pound barbell over your head then suddenly 40 pounds is added when you go to lower it. "In my opinion, X-Force is the most advanced technological equipment available today and we brought it to Philadelphia," said Schwab. Sinead Cummings uses the Leg Press machine. "We wanted to do something that was going to work for her, for him, for them, for anybody. Everybody can make improvements and advancements in their health and fitness on X-Force equipment. From the weakest man to the strongest woman, everybody can do it," he continued. The aim was to do around eight or 10 reps for each machine, but as soon as you lose the strength to do another rep, it's time to move onto the next exercise. You swiftly move from machine to machine. It was surprising how quickly my heart rate went up and how quickly I broke into a sweat. Five minutes using X-Force gave me a similar feeling to spending an hour in an ordinary gym. Moving onto the upper body machines, it was clear I didn't have as much strength in my arms. The workout started to get really difficult. When I first tried the Pec Arm Cross machine, I couldn't do it until Schwab lowered the resistance and helped me push through three reps. Writing this now, I feel soreness in my underused muscles – but the good kind – from knowing I hustled through a tough workout. I can understand why a week is recommended to recover from X-Force. Lifting my arms isn't easy right now. X-Force owner and certified personal trainer Roger Schwab assists PhillyVoice reporter Sinead Cummings on the Pec Arm Cross machine. During my session, I worked out my quads, glutes, hamstrings, calves, inner and outer thighs, hip flexers, back, shoulders, chest, biceps, triceps and core. And I only made it through 18 minutes of the proposed 30. So how much does it cost to work out at X-Force Philadelphia? Is it worth it? A single session with your trainer is $85, but if you buy in bulk, there are discounts. Ten sessions are $800 and 20 sessions are $1,500. Since you shouldn't go more than once a week, a 20 pack could last you five months or longer. For those who are short on time but not funds, this could be a great fitness regime. You'll feel the effects from the get-go. The gym also boasts an on-site registered dietician, making it a one-stop shop for overall health and fitness. X-Force Philadelphia is located in the Graham building, looking out at Dilworth Park. The address is 30 S. 15th Street, Philadelphia, PA 19102.